It’d be labouring a point to say that Gorgeous George’s outhalf policy backfired; it just didn’t work out quite as effectively as he had planned. Mallett started the diminutive Brive-back-up Luciano Orquera in the No10 jersey. Orquera is a tidy little footballer, but both adjectives are pointed: he’s tidy, rather than particularly gifted, and he’s little – 170cm [5’7”] and 78kg [172lbs]. The English – and in particular Chris Ashton – ran down and through his channel all day in the Six Nations fixture on their way to a monster 59-13 thumping, and while Orquera’s defense improved as the championship wore on, it’s always going to be a targeted liability when you have world class big boppers like Sean O’Brien and Stephen Ferris in your team. Even if he wanted to tackle them, he couldn’t. Mallett thusly hid Orquera in defense as much as he could during the first half. In comparison to the rest of his backline, he rarely defended his position – sure, he was caught there a few times, but just as often he was posted out on the wing or at fullback. Recognising that the Irish staff would have picked out his hiding places by half-time and would tweak their game-plan to get runners going down his channel, wherever that was – and you can’t move a guy indefinitely, as the coherence of the defense would become confused and would suffer – Mallett substituted him at halftime and replaced him with Riccardo Bocchino, a bigger, more structurally sound defender. Bocchino defended the outhalf channel a lot more often in the second half than Orquera had done in the first. However, when guys like Zanni, Parisse and Mauro Bergamasco are getting plowed by the Irish flankers in contact, a sub outhalf isn’t going to stem the tide. 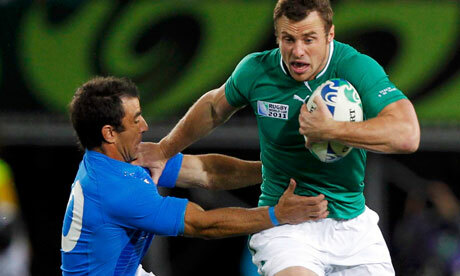 Crucially, Tommy Bowe was able to exploit Bocchino’s defense – essentially the difference in pace between the two of them – and round him for Ireland’s first try. Bowe takes the ball going left and makes an outside break around Bocchino which the Aironi man simply didn’t have the speed or experience to deal with. A bit of a classic in its own way, and certainly well-finished off by Brian O’Driscoll, who took an outside-in supporting line to receive a nicely-timed pass from the Monaghan crooner and scoot over. This entry was posted in RWC 2011 and tagged Brian O'Driscoll, Ireland, Italy, Luciano Orquera, Nick 'Gorgeous George' Mallett, Riccardo Bocchino, Tommy Bowe by dementedmole. Bookmark the permalink. Bowe’s run was very reminiscent of campo, I think 91 semi against all blacks. Take that Tim not nice but dim horan! Would it be fair to say Orquera looks like his namesake Lucky?